Chameleon color for a trio of kitchen styles. Blue-green is such a soothing color family it rolls on, underrated, as a choice for kitchens. Despite the trendy showing of all-white, black-and-white and most recently gray schemes over the last 15 years, blue green kitchens have their own consistent fan base. But because there are so many variations in any hybrid hue, an inspiration photo can be difficult to pin down. These three kitchens fall directly into this category. So I decided to do a little color matching using Benjamin Moore palettes. While that can be tricky considering the variation in computer monitors, it provides a starting point. 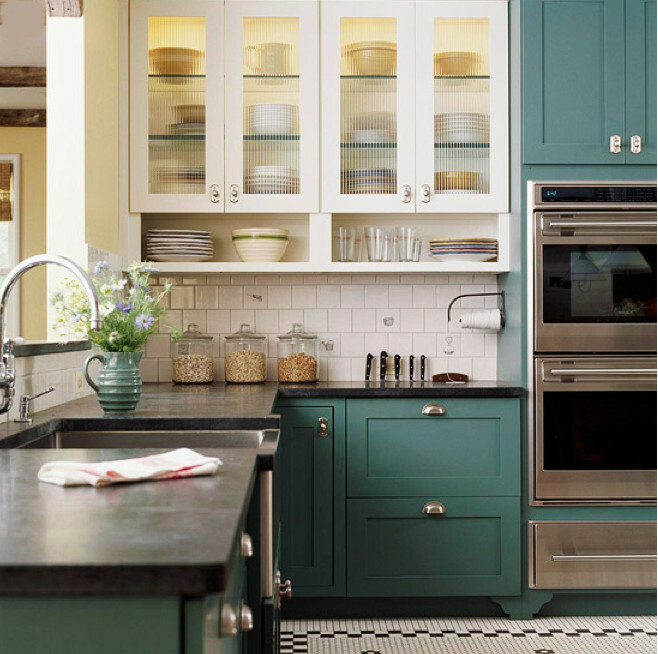 A strong but muted blue-green [top] functions like a neutral in this classic kitchen. It isn’t. In fact, it’s a strong color with a black undertone. Yet it’s tempered by white as a secondary color in the upper cabinets and bistro-tile floor, and by black accents in the floor and on he Wolf ovens. The color is similar to BM’s Dragonfly (AF-510).  Paler blue-green, paired with white, was popular during the 1940s and is now associated with cottage style. 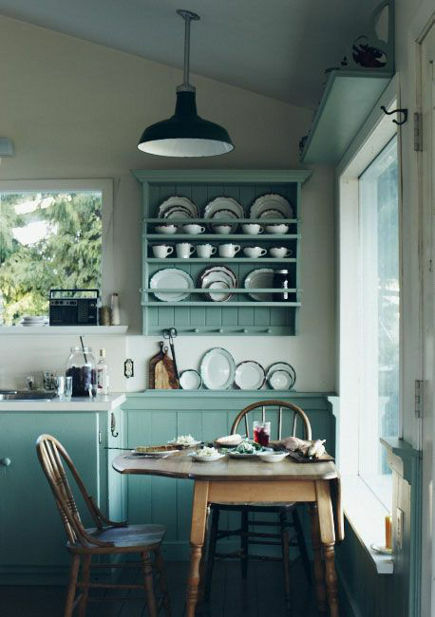 Leaning towards the teal/turquoise blues, this hue has a soft homey appeal that whispers vintage, too. Celeb designer Nate Berkus had a surprisingly simple green kitchen in his former Chicago apartment. Those of us who remember vintage St. Charles kitchens can easily spot those iconic metal cabinets that came in a wide variety of hues, though this may not be the original color. Some people removed them when the paint chipped and the shelves rusted but in the Berkus kitchen they take on an industrial edge mixed with a 19th century architects table and 1950s school chairs (as well as a Viking range). BM’s Steamed Spinach (643) looks like a close match. Where can I find this cabinet hardware that has the latch look without being actual latches? Thanks! The round ones are called cup pulls. Big hardware sites like Chown Hardware, Lee Valley and others are good places to start. Thanks Jane. I have scoured the web, called manufacturers and nothing exact:( I will prevail! Which picture and which latch are you looking for exactly? I have other ways to search sometimes.